BOB ABERNETHY, host: The clear theme of this program about President Clinton, about Henry Lyons, is forgiveness for doing wrong. Here’s one more example: the world of Christian rock music, where performers are under vigilant scrutiny from their fans over what they write, where they perform, and how they live their lives, and woe betide the Christian rock star who falls. Our correspondent Lucky Severson has been listening to Christian rock’s words and music. SEVERSON: She can sing to high heaven. 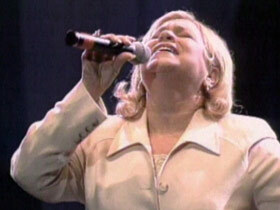 Sandi Patty is one of the reasons Christian music is growing faster than any other kind of music in America. 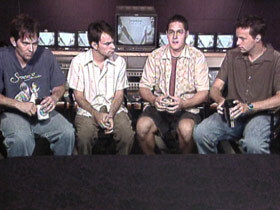 UNIDENTIFIED WOMAN: And the Dove Award for group of the year goes to: Jars of Clay! SEVERSON: You may not know this group, but millions of Americans do. Jars of Clay is another reason Christian music, according to the Recording Industry Association of America, is now more popular than jazz or classical. Amy Grant has sold over 20 million records. Without her, Christian music might not have grown into a $500 million-a-year industry. But it’s an industry at a crossroads, caught between the devil and a hard place, between commercial success and fundamental Christian values, and between very high expectations and real-life temptations. 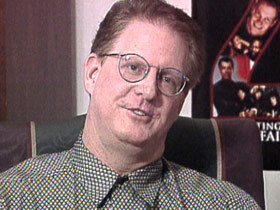 An expert on Christian music and publisher of CONTEMPORARY CHRISTIAN MUSIC magazine, John Styll. Mr. JOHN STYLL (Publisher, CCM Magazine): There’s always tensions that are going to exist when Christianity and commerce mix. Anytime you’re doing something for money and it contains the gospel, it has the potential to smell funny. SEVERSON: Some Christian music today would have been locked out only a few years ago. This is high-decibel rock ‘n’ roll. The group is called DC Talk, and their music is reaching out to kids who normally wouldn’t be there, and it’s making money. It worked for Amy Grant. Her career hit a plateau until she branched into pop music. Suddenly her record sales blossomed, and so did her conservative critics. Mr. STYLL: I don’t think there’s hardly anybody out there that doesn’t know that she’s a Christian, what she stands for, and yet people see a direct correlation, or they think they see a direct correlation, between her taking Jesus out of her music and selling more records, and therefore, she has somehow sold out. SEVERSON: Another group accused of selling out, Jars of Clay, one of Christian music’s top rock bands. 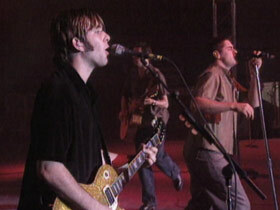 Their song “Flood” was number one on MTV and secular radio stations throughout the country. They still travel with their pastor, but their lyrics include fewer heavenly phrases. They sing more about social and personal issues. Mr. DAN HASELTINE (Jars of Clay): We write music, and our songs are hopefully written in a way that it doesn’t alienate people who aren’t Christians. The issues that we deal with are issues that everybody deals with. SEVERSON: For many old-time and hard-line fans, Jars of Clay has gone too far. But even some of the pioneers in this business who have not ventured into the mainstream, like Sandi Patty, think there’s plenty of room and even a need for groups like Jars of Clay. 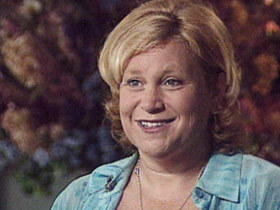 Ms. SANDI PATTY: These kids don’t face the same issues that I did when I was growing up. I mean, they’re having to make choices a lot earlier in their lives about sexuality, about drugs, about alcohol, and I am thrilled that there are some groups out there that the kids relate to. Mr. STYLL: Most Christians are generally supportive of the idea of any Christian group getting their message out there where people can hear it. Now, they do get a little uncomfortable when a band decides they want to play in bars and lounges where people are drinking and who knows what is going on, and Jars of Clay has had their share of criticism for going into, you know, that venue. UNIDENTIFIED MEMBER OF JARS OF CLAY: There have been times when someone has said, “I saw someone drinking a beer at your concert,” or “I smelled pot in the back of the club.” We’re not playing for those kind of people, as well as the people who grew up in churches, and like our music, then why — what’s, you know — what are we doing? Mr. STYLL: I think, though, that’s exactly where Jesus would be if he were here today. He’d be in bars trying to minister to people, and I think he would be criticized. SEVERSON: It’s a tough balancing act for these groups and performers, staying true to their values and at the same time branching out or reaching out. Christian music standards are high, some would argue too high. Even the very best among them have a difficult time walking the straight and narrow line. Few would argue that one of the best in the business is Sandi Patty. She won 35 Dove Awards — gospel music’s most prestigious honors, five Grammys, sold 11 million records. A few short years ago, when she was at the top of the Christian charts, she fell, all the way to the bottom, when she announced that she had had an affair and then got a divorce. Mr. STYLL: It’s a safe statement to say that her career virtually stopped at that point. She had an album that was about to come out from a Christian record label, a Christmas album; they put it on the shelf, they waited a year before they put it out. She was forced off, but she voluntarily took herself away to sort of rebuild her life, and she’s slowly starting to come back. Ms. PATTY: I have made huge mistakes in my life. I don’t mean that as a copout or an excuse or anything, but I guess that’s been a helpful revelation to me to go, “You know what, I — I cannot foster this life-is-perfect-I’ve-got-it-all-together image,” because the higher you try to do that, the farther you fall. I know that better than anybody. Mr. STYLL: This kind of scandal just doesn’t fade away very easily in the Christian community, because they expect the artist to live the values that they sing about. And even though forgiveness for sin and grace is part of that, it’s a little harder for people to apply that, it seems. SEVERSON: Sandi Patty is now on the comeback trail. 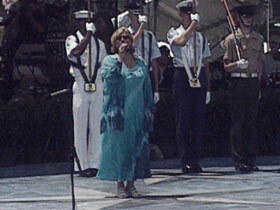 She performed at the Fourth of July celebration in the nation’s capital. 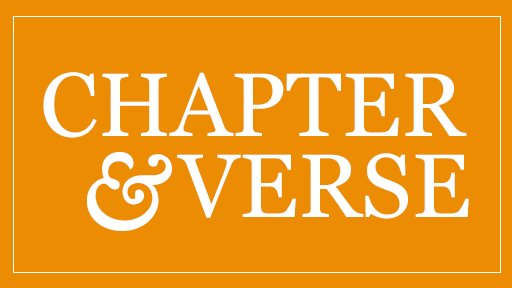 She has a new husband, a new adopted son, Sam, and she has a new perspective and an album about grace and forgiveness. Ms. PATTY: I think anything good can come out of any situation, and there have been some very positive things. If that’s what it’s taken for me to become who I am today, much more confident in my relationship with God, much more confident in who — who I am and much more realistic about my weaknesses and strengths, you know what, I would do it all again if that was the only way. SEVERSON: She sings about God’s forgiveness, but forgiveness from people who were once her fans may take a little longer. I’m Lucky Severson for RELIGION & ETHICS NEWSWEEKLY.